The keepers at Terra Natura Benidorm have found ways to keep their animals entertained in their enclosure. The keepers' close bond with the animals means they soon get to know their likes and dislikes, customs and tastes. Based on these, they have found ways to help them break their routine and keep body and brain active. Instead of placing their food in a bowl. Which is boring. Terra Natura Benidorm is putting food in different parts of the animals' enclosures, so they have to use their nose to find their food. The animals are, therefore, entertaining themselves and playing so they keep motivated and don't get bored. This technique is working particularly well with the dhole wild dogs, peccaries, armadillos and donkeys. In the case of armadillos, a feed dispensing trunk with different holes has been designed, which they have to roll to obtain the food inside - rather like dogs do with their Kongs. The predatory instinct of the dholes leads them to tear their prey. Based on this behaviour, the keepers have prepared large trunks of palm tree that can be torn as if they were a dam. 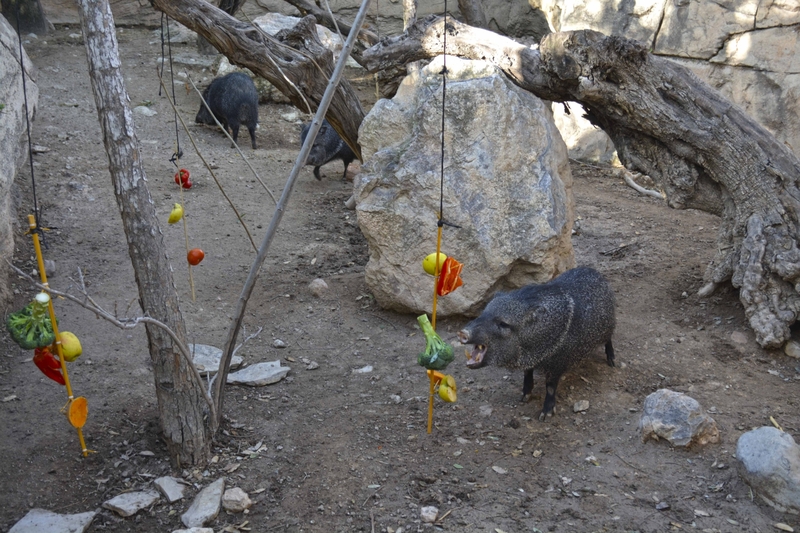 For the peccaries, they are hiding their food or hanging it at different points of the pen so they can find broccoli, apples, peppers or carrots that they like so much. But they are not the only animals having their food put in high places. Donkeys are given fruit and vegetables in the branches of trees or other high areas so they have to stretch to find it.